The word that inspired this project is Challenge. "Be limitless. Challenge yourself. Do more than is expected. Be better than. Be the best you can be at this moment." Daily Affirmation Cards and Booklet by Melissa Reyes. For the last 81 projects, I've been challenged to design projects that I think you would like to paint. To switch it up, I asked 'you' for help in deciding upcoming projects. It has been a joy reading your ideas. This is the result. 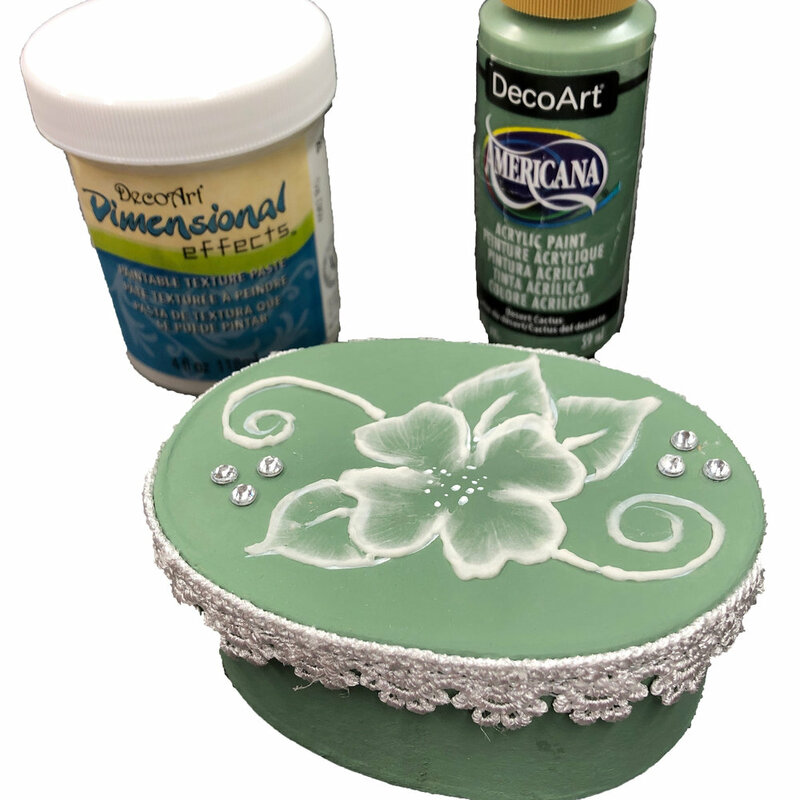 In this lesson we will be learning how to use DecoArt Dimensional Effects to create a 3D effect on a paper mache box. This design can be left white or painted with acrylic paints. I believe it is a 'challenge' for all of us. Oval Paper Mache box 3 1/2"
Palette: DecoArt Desert Cactus DA331 and Snow White DA01. If you'd rather choose another base color, make sure it is a medium to dark value. Prep: Apply a coat of Sealer. Dry. Apply 2 coats of the base color. Dry. Transfer on the design using white graphite paper. Using a #10/0 Dresden Liner, outline the design. Dry.